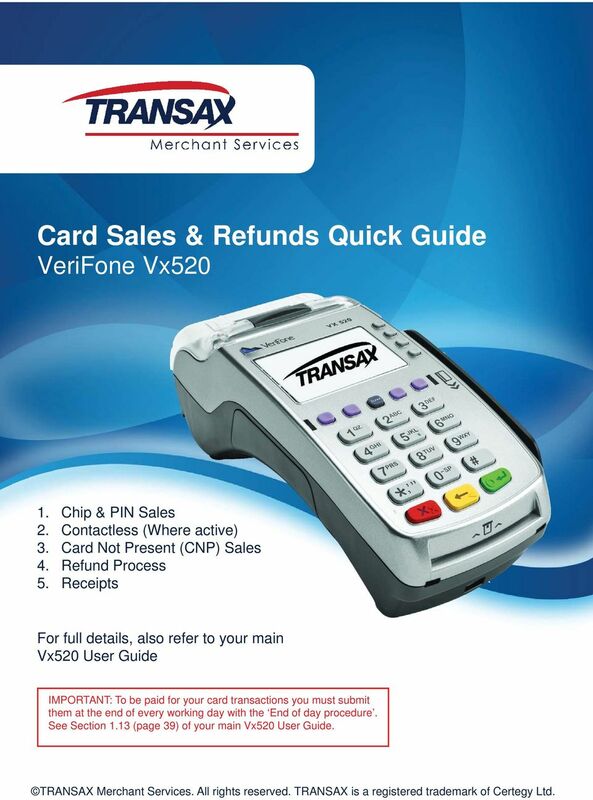 Download "Card Sales & Refunds Quick Guide VeriFone Vx520"
1 Card s & Refunds Quick Guide VeriFone Vx Chip & PIN s 2. Contactless (Where active) 3. Card Not Present (CNP) s 4. Refund Process 5. 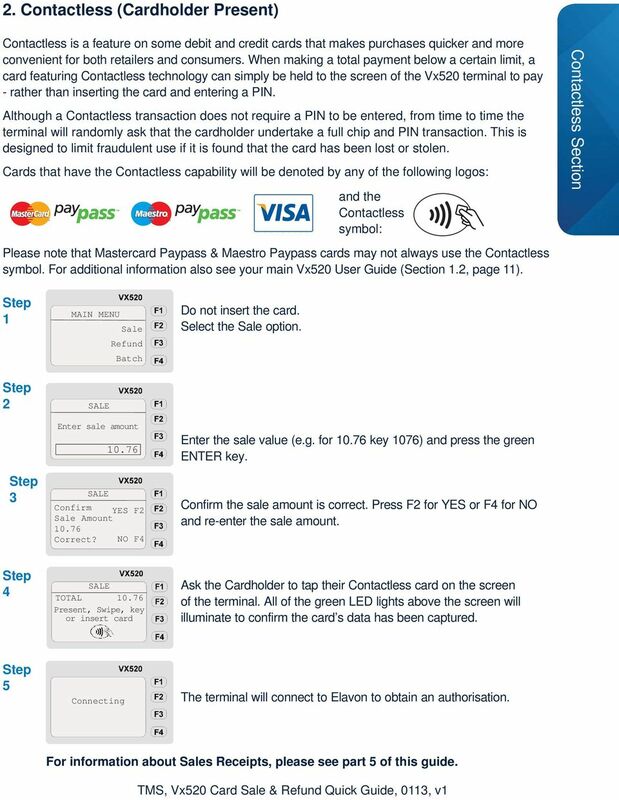 Receipts For full details, also refer to your main Vx520 User Guide IMPORTANT: To be paid for your card transactions you must submit them at the end of every working day with the End of day procedure. See Section 1.13 (page 39) of your main Vx520 User Guide. 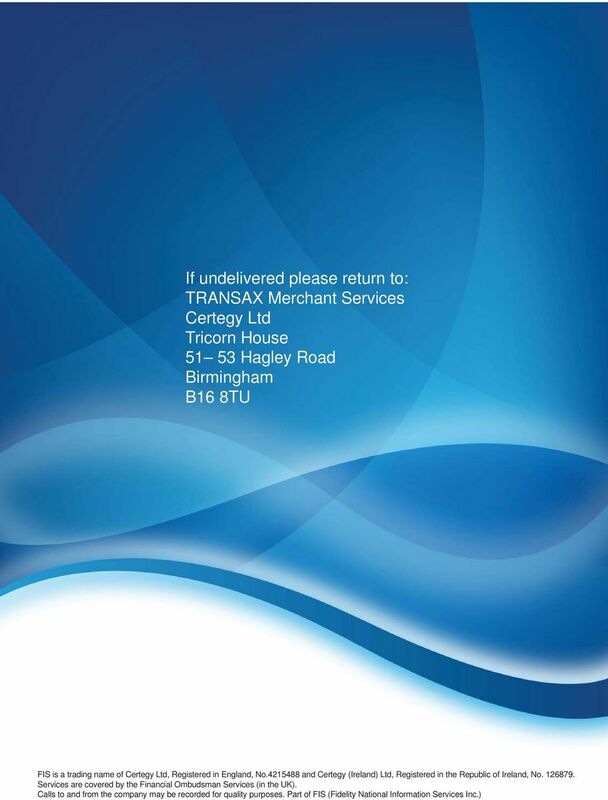 TRANSAX Merchant Services. All rights reserved. TRANSAX is a registered trademark of Certegy Ltd.
2 1. Chip & PIN Process (Cardholder Present) Chip & PIN Section When accepting payment by credit or debit card when the cardholder is present at the time of the transaction. For additional information also see your main Vx520 User Guide (Section 1.3, page 12). If your machine is set up in Hotel Mode also see Section 1.11, page 32. For Restaurant Mode see section 1.12, page MAIN MENU Refund Batch Select the option. You may need to scroll down through the menu by pressing the second from left purple function key to fi nd this option. 2 Enter sale amount Enter the sale value (e.g. for key 1076) and press the green ENTER key. 3 Confirm YES F2 Amount Correct? NO F4 Confirm the sale amount is correct. Press F2 for YES or F4 for NO and re-enter the sale amount. 4 TOTAL Present, Swipe, key or insert card Insert the credit or debit card into the front of the terminal with the chip first, facing up. If cash back is enabled for your machine and the card also supports cash back (e.g. most debit cards), you will be prompted to enter a cash back amount. 5 6 MASTERCARD ENTER PIN XXXX Connecting The customer must enter their 4 digit PIN (Personal Identification Number) - ask them to do this discreetly. Ensure the green ENTER key is pressed after the PIN has been entered. The terminal will connect to Elavon to obtain an authorisation. For information about s Receipts, please see part 5 of this guide. 3 2. Contactless (Cardholder Present) Contactless is a feature on some debit and credit cards that makes purchases quicker and more convenient for both retailers and consumers. 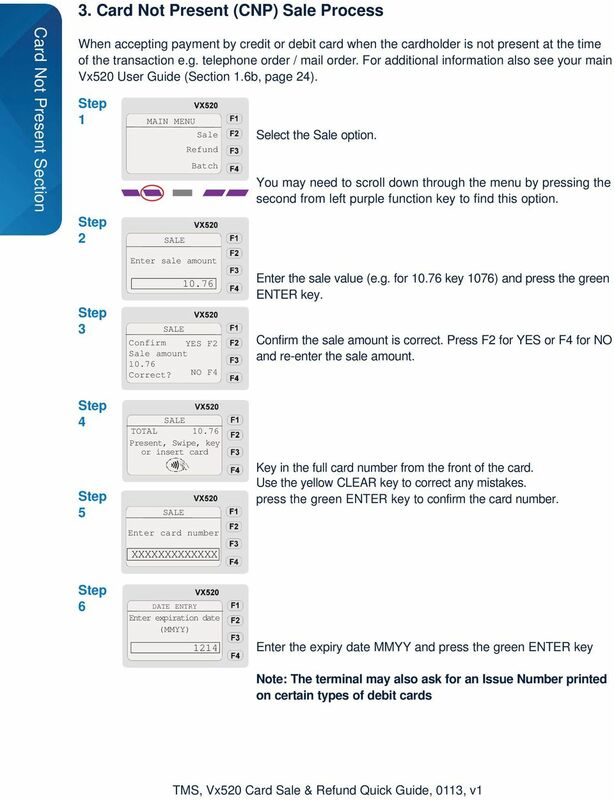 When making a total payment below a certain limit, a card featuring Contactless technology can simply be held to the screen of the Vx520 terminal to pay - rather than inserting the card and entering a PIN. Although a Contactless transaction does not require a PIN to be entered, from time to time the terminal will randomly ask that the cardholder undertake a full chip and PIN transaction. This is designed to limit fraudulent use if it is found that the card has been lost or stolen. Cards that have the Contactless capability will be denoted by any of the following logos: and the Contactless symbol: Contactless Section Please note that Mastercard Paypass & Maestro Paypass cards may not always use the Contactless symbol. For additional information also see your main Vx520 User Guide (Section 1.2, page 11) MAIN MENU Refund Batch Enter sale amount Confirm YES F2 Amount Correct? NO F4 Do not insert the card. Select the option. Enter the sale value (e.g. for key 1076) and press the green ENTER key. Confirm the sale amount is correct. Press F2 for YES or F4 for NO and re-enter the sale amount. 4 TOTAL Present, Swipe, key or insert card Ask the Cardholder to tap their Contactless card on the screen of the terminal. All of the green LED lights above the screen will illuminate to confirm the card s data has been captured. 5 Connecting The terminal will connect to Elavon to obtain an authorisation. For information about s Receipts, please see part 5 of this guide. 5 3. Card Not Present (CNP) Process, continued 7 8 CUSTOMER PRESENCE YES (F2) Is customer present? NO (F4) Not present CVV2 Present NUMBER Illegible IS... Absent The screen will ask whether the customer is present. 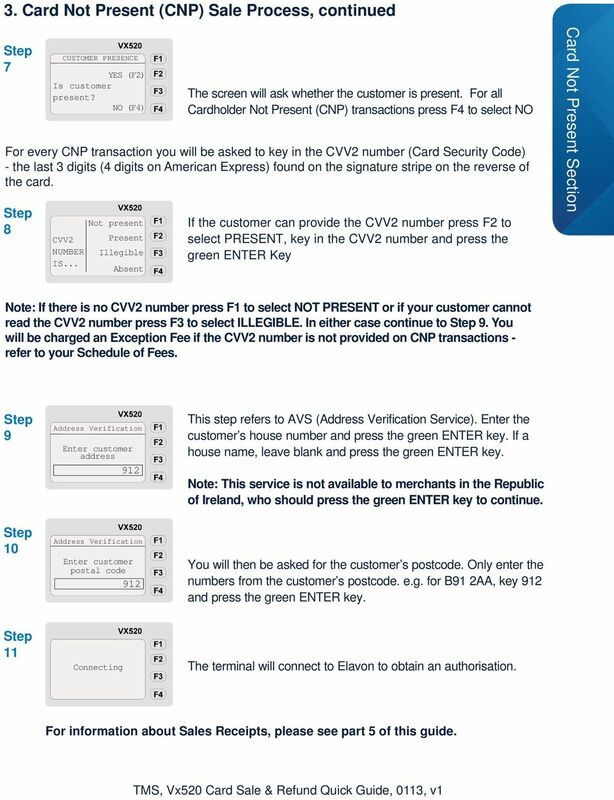 For all Cardholder Not Present (CNP) transactions press F4 to select NO For every CNP transaction you will be asked to key in the CVV2 number (Card Security Code) - the last 3 digits (4 digits on American Express) found on the signature stripe on the reverse of the card. 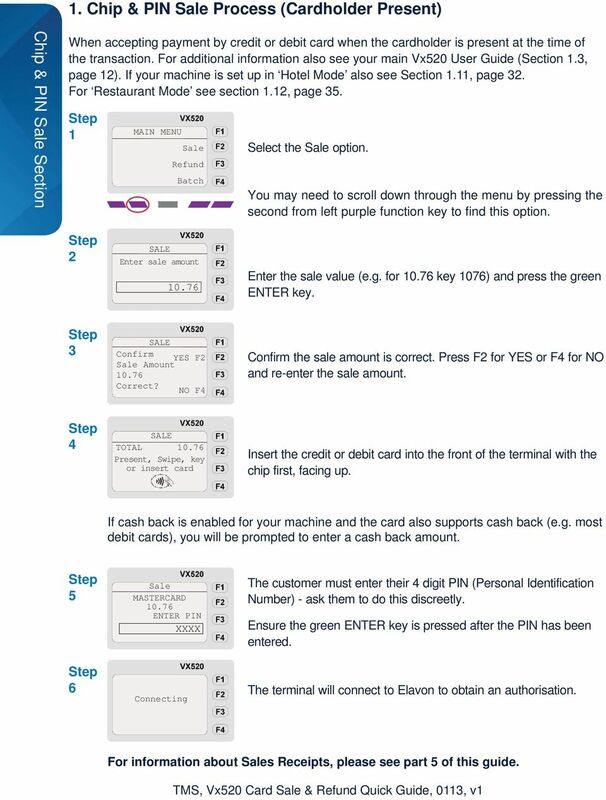 If the customer can provide the CVV2 number press F2 to select PRESENT, key in the CVV2 number and press the green ENTER Key Card Not Present Section Note: If there is no CVV2 number press F1 to select NOT PRESENT or if your customer cannot read the CVV2 number press F3 to select ILLEGIBLE. In either case continue to 9. You will be charged an Exception Fee if the CVV2 number is not provided on CNP transactions - refer to your Schedule of Fees. 9 Address Verification Enter customer address 912 This step refers to AVS (Address Verification Service). Enter the customer s house number and press the green ENTER key. If a house name, leave blank and press the green ENTER key. Note: This service is not available to merchants in the Republic of Ireland, who should press the green ENTER key to continue. 10 Address Verification Enter customer postal code 912 You will then be asked for the customer s postcode. Only enter the numbers from the customer s postcode. e.g. for B91 2AA, key 912 and press the green ENTER key. 11 Connecting The terminal will connect to Elavon to obtain an authorisation. For information about s Receipts, please see part 5 of this guide. 6 4. Refund Process Refund Process Section A Refund is when the value of a transaction is credited back to a card for a sale that may have been processed earlier in the day or on a previous date, for example, when goods are returned. 1 MAIN MENU Refund Batch Select the Refund option. You may need to scroll down through the menu by pressing the second from left purple function key to fi nd this option. 2 3 REFUND Swipe, key or insert card REFUND MASTERCARD 4251 XXXX XXXX XXXX Enter amount Insert the credit or debit card into the terminal with the chip first, facing upwards OR swipe the card or key the card number. Note: Refunds cannot be processed as a Contactless type transaction. The screen will display the card type (e.g. Mastercard or VISA) and the card number. Enter the refund value (e.g. for key 1076) and press the green ENTER key As soon as the refund has been processed the terminal will print the Merchant Copy of the receipt which the customer must sign. 4 CHECK SIGNATURE Is the YES (F2) signature valid? NO (F4) The terminal will ask you to verify that the signature is valid and matches that on the card. If it does, press F2 to select YES. For information about Refund Receipts, please see part 5 of this guide. 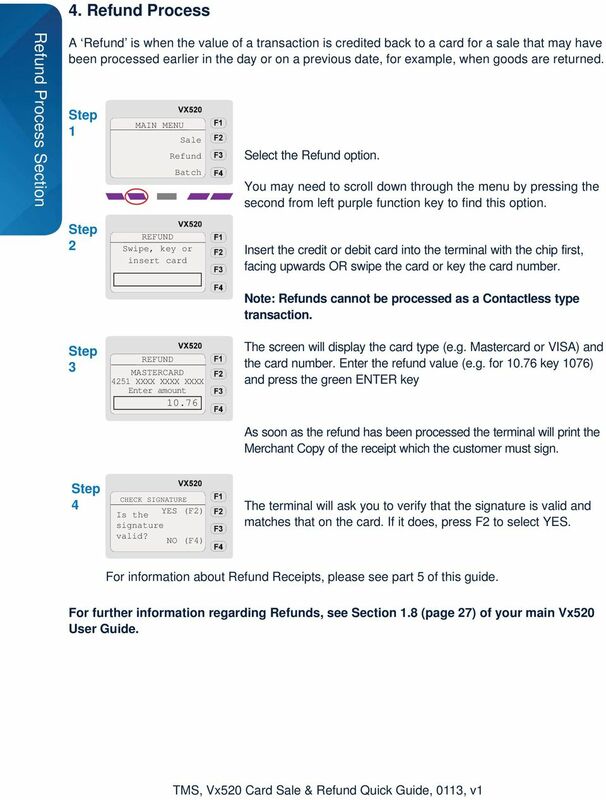 For further information regarding Refunds, see Section 1.8 (page 27) of your main Vx520 User Guide. 7 5. Receipts s Receipts When the transaction has been authorised the terminal will print the Merchant Copy sales receipt. Keep the receipt safe and secure for 18 months as you may be asked to provide it in the event of a Chargeback (i.e. any query raised by the cardholder or the card issuer). Secondly, the terminal will print the Customer Copy sales receipt, this must be given to your customer in addition to any other invoice receipt that you may provide. 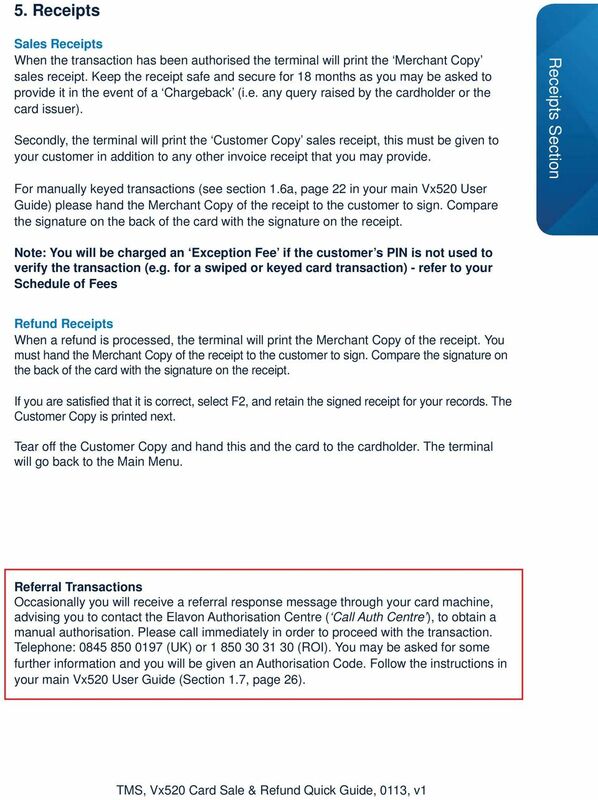 For manually keyed transactions (see section 1.6a, page 22 in your main Vx520 User Guide) please hand the Merchant Copy of the receipt to the customer to sign. Compare the signature on the back of the card with the signature on the receipt. Receipts Section Note: You will be charged an Exception Fee if the customer s PIN is not used to verify the transaction (e.g. for a swiped or keyed card transaction) - refer to your Schedule of Fees Refund Receipts When a refund is processed, the terminal will print the Merchant Copy of the receipt. You must hand the Merchant Copy of the receipt to the customer to sign. Compare the signature on the back of the card with the signature on the receipt. If you are satisfied that it is correct, select F2, and retain the signed receipt for your records. The Customer Copy is printed next. Tear off the Customer Copy and hand this and the card to the cardholder. The terminal will go back to the Main Menu. Referral Transactions Occasionally you will receive a referral response message through your card machine, advising you to contact the Elavon Authorisation Centre ( Call Auth Centre ), to obtain a manual authorisation. Please call immediately in order to proceed with the transaction. Telephone: (UK) or (ROI). You may be asked for some further information and you will be given an Authorisation Code. Follow the instructions in your main Vx520 User Guide (Section 1.7, page 26). TRANSAX Merchant Services Accept more! Better service, lower rates. Merchant Operating Guide ROI. Elavon Merchant Services PO Box 56 IDA Business Park Arklow Co. Wicklow. Authorisations (ROI): Tel.